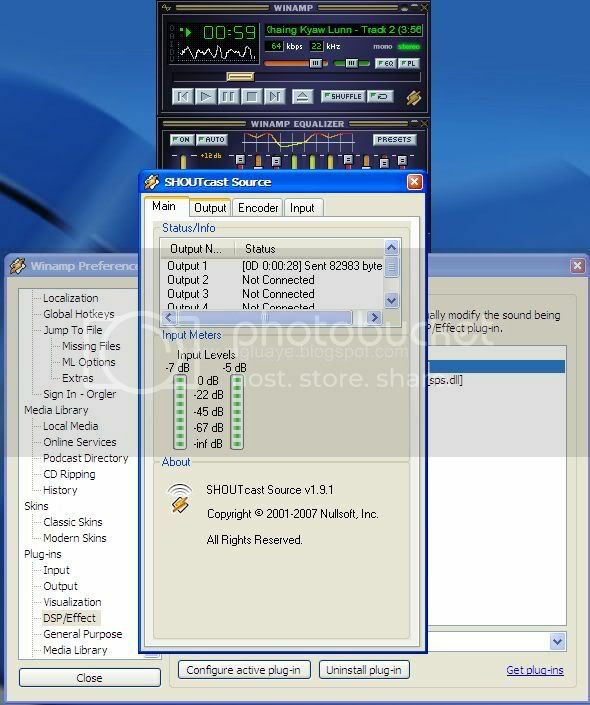 To be able to set up Free Online Internet Radio Station, you'll need two software, Winamp software and Shoutcast plug in. First of all, please go to http://www.winamp.com. Click on the free download icon on that page. It will redirect to download page. Please select Winamp Standard, and click on free download mode. Click on “Save file” and Winamp will be downloaded. 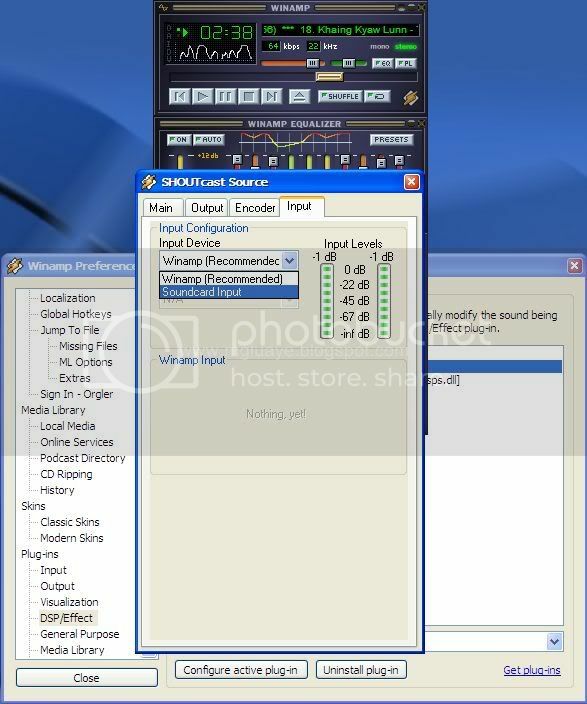 Then, run the setup of Winamp. After installation of Winamp done, go to another website http://www.shoutcast.com. On homepage of Shoutcast, click on Download/ Be a DJ. It will redirect to download page. 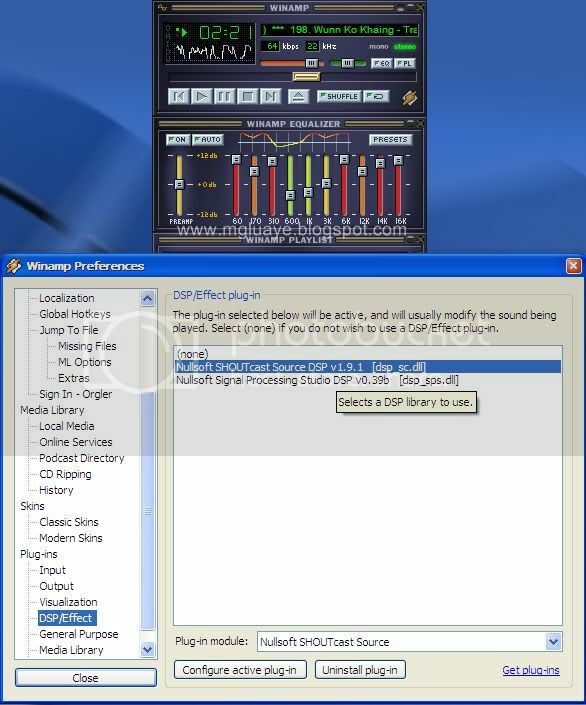 Scroll down a bit on download page, you will see link to download DSP plug-in to download. Click on it, it will download DSP Plug in. 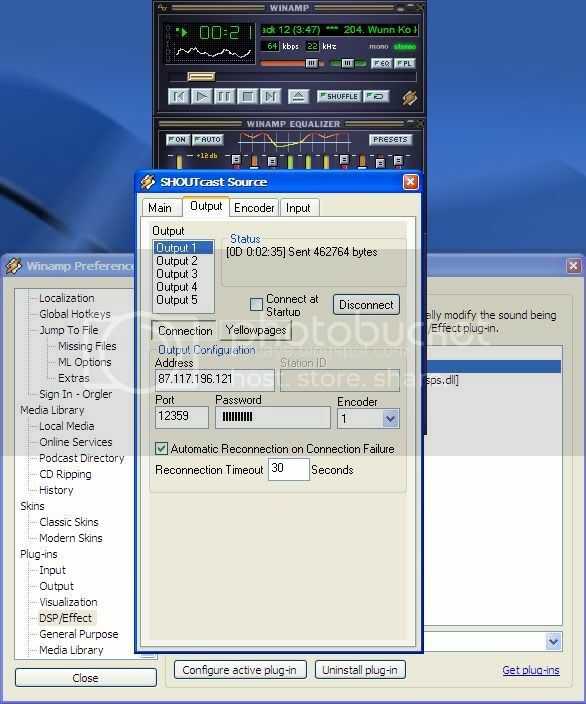 Select “Save file” and run installation of SHOUTcast DSP Plug-in. Then, run Winamp. Click on the menu tab on upper left corner. One pop up menu will come up. Select Option >> Preference. On preference menu, you have to find Output and select Nullsoft NULL Output Plug-In V1.11 beta (x86) [out_null.dll]. 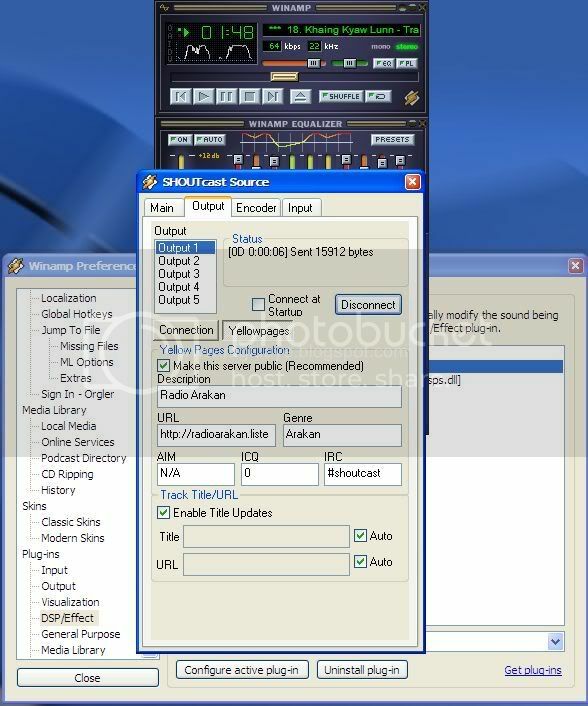 Then go to DSP/Effect tab and select Nullsoft SHOUTcast Source DSP 1.9.1 [dsp_sc.dll]. Then click on button “Configure active plug-in”. Turn off Winamp and reopen it. Play a music file. Music won’t come out from your speaker, the reason is that you have changed Output format already. Click on “Sign Up”. Sign in with your username and password. You need to type in two different passwords, one is for broadcaster password and the other one is for admin password. 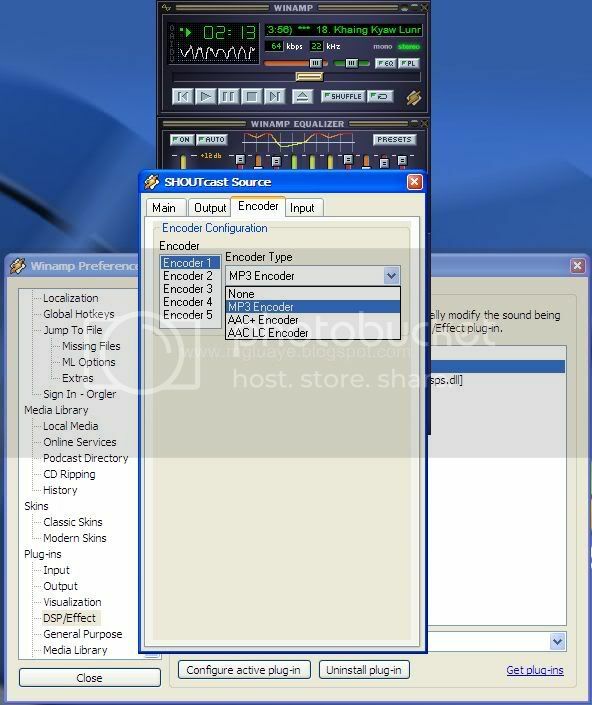 Admin password is for accessing web server and broadcaster password to use it on streaming software, winamp. Fill in radio name and URL too. Then click on “ON/OFF”. It will be redirected to a page with ON/OFF button as follow. Click on “turn on”. Before clicking on “turn on”, radio status will show “off” and then will change to “on”. Copy down all the URLs shown on the page to a notepad or Microsoft words, then you can log out if you want to. That’s all to do it on webservice. The rest part will need to configure on Winamp side. Run Winamp. SHOUTcast window will open too. We will go through tab by tab. 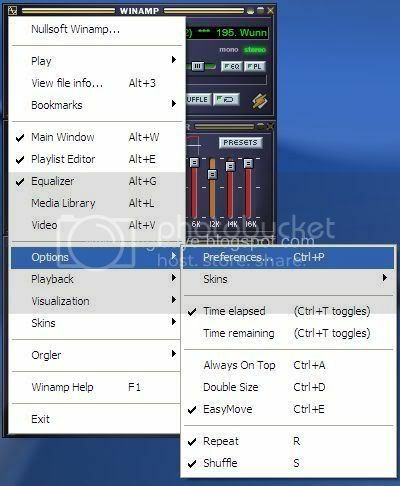 On Input tab, select Winamp input. Then click on encoder tab. Select encoder number and encoder type. You are going to broadcast, music in mp3, select mp3 encoder. Then output tab, select output. There are two items need to set up on this tab, connection and Yellowpages. For connection, you may need to fill in Address, Port and password. And the other thing is to set encoder number. Encoder number must be same with the one you selected on encoder tab. Then click on Yellowpages tab. Fill in radio description, URL, and Genere. Then click on connect button below “Status”. If everything is in order, status will show that data is sending out. You can go and see “Main” tab whether your radio is working or not. OK. You choose the music files from your computer as you want to broadcast. One more thing left, you want to talk to your listeners on transition or what will be next, blah blah blah blah, right? OK. Go to Input tab. Choose input device from “Soundcard Input”. Now you can talk through already. The music you are playing will be faded to lower level while you are choosing “Soundcard Input”. And if you want to mute music totally, you may need to click on “Push to Talk”. You can adjust Music Level, Background Music Level, Mic Level and Fading Time on this tab. So, the setting up is completed. Where you can go and listen music you had been broadcasting? You have copied down from Radio Details page, right? You just simply click on those links to go and listen your radio. And further info, you can reach this radio in http://radioarakan.blogspot.com and can listen on sidebar of Mgluaye's Pages too. Hope you all have fun to broadcast radio over internet. Wooh!! You've read all the way to end of this super long post, I have one free gift for you. That's How To Set Up Free Online Internet Radio Station in Burmese Version. Sounds interesting, Right??? Thank you for visiting my blog and keep in touch. like to make some invite posts on my blog? No Water Throwing In Peninsula Plaza!! !